When it comes to wine these days, everyone is talking about drinking “natural.” No, that doesn’t mean sipping Sancerre in the buff (although hey, you do you). In a nutshell, natural wine is sort of like organic food: It’s made without chemicals or preservatives, usually by small producers. And luckily, New York has a whole host of wine bars that specialize in the stuff. Here are our seven favorite spots to kick back with a glass (or bottle). This Soho hangout is a favorite among sommeliers, hipsters and in-the-know wine enthusiasts. The wine list is enormous, touching on just about every wine region you’ve ever heard of (and many you haven’t). But our favorite aspect of this place is the mystery glass option, perfect for those practicing their blind tasting skills or just looking for a challenge. Order it in either red or white, and if you guess the correct wine from the 500 or so options, you win the rest of the bottle for free. Oh, and the cacio e pepe popcorn is never a bad idea. This laid-back wine bar on Orchard Street is a spin-off of Contra, the popular tasting-menu restaurant next door. With its high-top tables and sleek interior, Wildair might be a better fit for Paris’s Marais neighborhood than the Lower East Side. You’d be hard-pressed to find something unimpressive from the list of European wines or the menu made up of small plates like radishes with seaweed butter and the potato darphin (basically a giant hash brown) topped with decadent Maine uni. This tiny and constantly packed restaurant is the sort of place you want to become a regular. Expect seasonal shareable plates like liver mousse, cured Montauk scallops, and decadent burrata and nduja toast. The wine list, heavily slanted toward France and other European producers, is full of interesting bottles you’ve probably never seen anywhere else (think orange wine from Slovenia and pét-nat from the Czech Republic). We like to pop in for weekend lunch, when the $32 set menu is a total steal. A stone’s throw from Tompkins Square Park, this snug, French-inspired wine bar is one of our date-night standbys. There are only 19 seats in total, wrapped around a narrow bar, and the small-plates menu is constantly changing. On any given night, you can expect to see dishes like smoky eggplant dip and braised octopus, and the wine menu features varietals from lesser-known wine regions like Hungary and Croatia. At this self-proclaimed “naturalish” wine bar in Prospect Lefferts Gardens, all the wines are labeled either natural, sustainable, biodynamic or organic. Thanks to the thoughtful descriptions that accompany each bottle—things like “bell pepper crudités,” “herbal zing” and “volcanic smoke”—Glou makes it easy to pick out something that fits your flavor profile. Come for the wine, stay for the food, like the Parmesan-dusted Caesar wedge and fluffy Spanish tortillas with tomato jam. 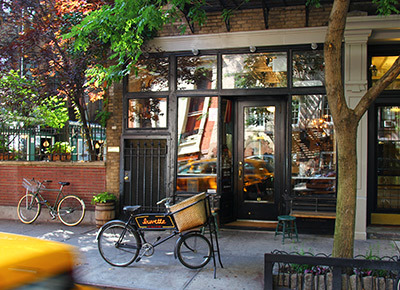 This quaint and cozy restaurant is one of our favorite places to grab a glass of wine in Cobble Hill. Not only does the wine list offer a handful of quality bottles under $50, but there’s also an extended selection from all over the globe. So if you’ve been itching to try a wine from the country of Georgia or Macedonia, this is the place. On sunny days, you’ll find us on the back patio drinking sparkling rosé with a plate of charcuterie and creamy stracciatella. Head to this Lower East Side tapas bar for European-inspired plates and a well-curated selection of natural wines from small producers. We especially love grabbing a seat before 7 p.m. for dollar oysters and a crisp glass of muscadet. Looking to expand your wine horizons? There’s something here for every palate, from Canadian honey wine and Swiss organic cider to easy-drinking Beaujolais and sparkling cava.